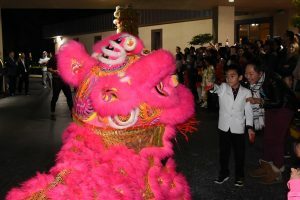 The Vietnamese community gathered to celebrate the most important event in their culture, the Lunar New Year on Feb. 4. 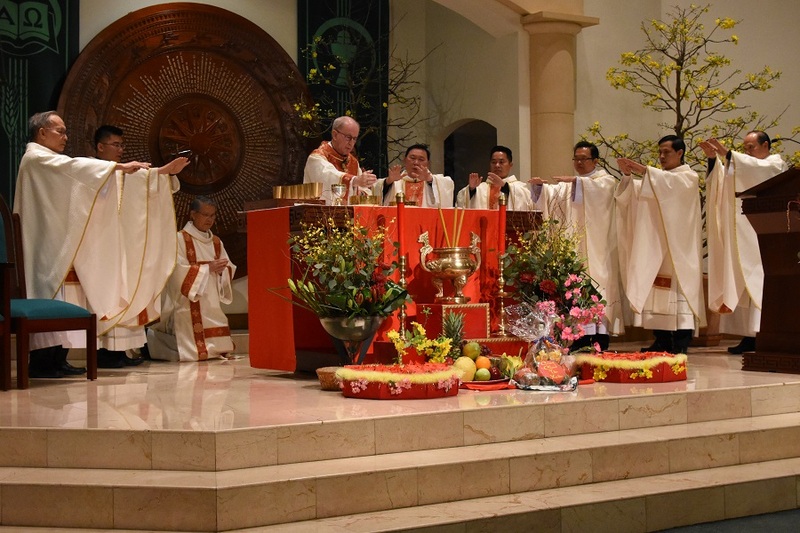 Bishop John Noonan celebrated Mass with eight diocesan priests and recalled the suffering of the Vietnamese people, but reminded them God is always with them. He shared in their cultural traditions, dances, fireworks and the handing out of cherished red envelopes – one holding a crisp dollar bill for good luck and the other with a Scripture verse on it for guidance. Lily Duong is from Cantho, South Vietnam – south of Saigon. She arrived in the U.S. with her siblings and mother in September 1987, after escaping communism. She was Buddhist when she met her husband, Vincent Trandoan, a cradle Catholic. Her conversion led her to a deep commitment to pass on the faith. 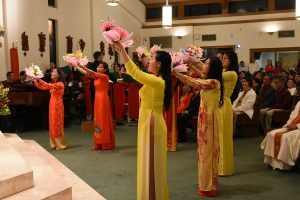 Today, as the director of religious education at St. Philip Phan Van Minh Parish in Orlando, Duong proudly shares Catholic teaching and Vietnamese tradition. Both of her children are catechists and are learning Vietnamese. Duong says celebrations like this help them “to understand our traditions. This is the day we pay respect to our ancestors – to celebrate and wish them longevity and good health.” Although she took her family to Vietnam several years ago, she feels the language and immersion in cultural traditions will help them understand who they are and where they came from. The procession, the liturgical dancers, the flowers and fruit, are all offered in thanksgiving and glory to God. 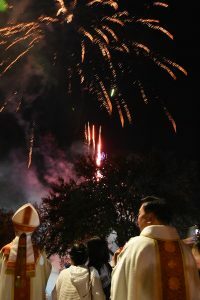 While our celebration honors the traditions of the Vietnamese; as Catholics, we do not believe in their symbolism as pagans would. The prayers used for Mass were taken from the Roman Missal; the readings themselves from the same option in the Lectionary.